Horrible shop need I say the least. Dont let the new name fool you this shop is still owned by the same people that owned abbsrry tires, if you remember, there reviews were all very nasty. I would stay away at all cost, I myself had a very bad experience there. Since my bad experience I have been told many,many stories of wheels falling off peoples cars after installation. They damaged things on my vehicle and removed things without my permission and then when I found out about it i told them to put the parts back in and the owner a very rude lady told me I had to pay them to put them back in. Anyway I could go on forever about this shop and there shady ways. I hope this is helpful and saves you the possibility of a very bad experience. These guys are awesome. Its rare to find a shop that cares for the after sales customer experience. I had issues with the finish of the wheels and without hesitation, they got them replaced with brand new ones even after almost a year after purchase. Id highly recommend these guy! Especially if youre looking for replica Audi, Mercedes and BMW wheels as they have a good selection. Worst tire shop. Needed a patch on my factory 22inch Chevy wheel...came out of the shop with a damaged rim...the "boss" Lady started giving me attitude right away and of course blames me for it saying its old and wouldnt own up to her employees causing this damage. Probably best to take a pic of the wheels before entering this garbage shop. Worst place. Garbage. Bought a great set of Toyo winter tires for my Volkswagen Passat. Great tires, great price and great service. If you ask questions, they help you with an answer without trying to sell you something you dont need. 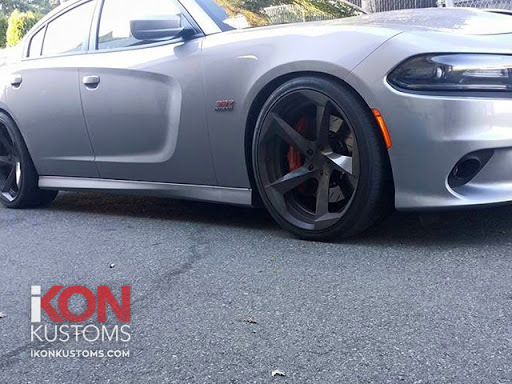 I recommend IKON Kustoms to anyone looking for tires, wheels and car maintenance services.